The Marina and Tonino dolls from Vestida de Azul are some of the most asthetically beautiful baby dolls we've ever seen. They are made with both vinyl body and soft body, so choose carefully! The full vinyl dolls measure 42cm and the soft body dolls measure 45cm. They have the same heads but their bodies are different. Some come with dummies, some do not. 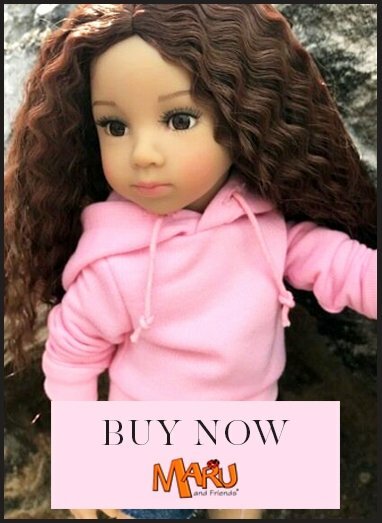 This doll comes with a pink dummy. This Marina girl doll is 42cm in height, has a full vinyl body. She has moulded hair, fixed blue eyes and wears a beautiful pink romper and matching hat. Vestida de Azul dolls are entirely made in Spain. Her eyes are framed by fibre eyelashes on the upper lid and his face paint is very natural. Her vinyl is soft to the touch. The doll is packed in a cardboard box.